The India Letter - Recommendation Service Based on Golden Decade Megatrend. At a time when India is potentially at the cusp of a major economic overhaul, the research team at Equitymaster has zeroed in on 7 visible signals or Megatrends that it believes will be the key tailwinds for the economy. And therefore we believe fundamentally sound companies whose business models are aligned to these Megatrends will benefit the most. The research report features the key Megatrend opportunity that is manifesting in the sector or the stock and a detailed analysis of the upsides and risks of a particular stock. "The India Letter" research reports recommend stocks from a 3 to 5 year's perspective and are published in public media (i.e. internet) on or before the third Wednesday of every month. What is the goal of The India Letter? The goal of The India Letter is to recommend high growth stocks that have some key economic Megatrends as a tailwind and could potentially deliver market beating returns over a long time frame. What does The India Letter offer? The report features the key Megatrend opportunity that is manifesting in the sector or the stock and a detailed analysis of the upsides and risks of a particular stock. Given the high growth nature of the stocks, the valuations take into account the PEG (price to earnings growth multiple) relative to that of the Sensex. What The India Letter does not offer? The India Letter is a generalized recommendation service. We do not offer customized opinion for any particular subscriber or class of subscribers. We are not qualified financial advisor nor Investment Adviser and we strongly recommend our subscribers to seek professional advice before taking any decisions for their investments. Who is the editor of The India Letter? 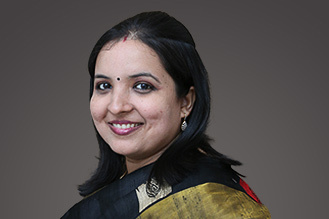 Tanushree Banerjee (Research Analyst), editor of The India Letter, started her career at Equitymaster covering the banking and financial sector stocks along with scrutinizing the RBI policies. And over the last decade, worked on developing Equitymaster's research processes that have helped pick out various multibaggers across all sectors. She is a firm believer of "safety first" when it comes to investing and closely follows the investing philosophies of Warren Buffett, Seth Klarman and Joel Greenblatt. She is the editor of the large cap recommendation service, StockSelect as well. What is your stock selection process for The India Letter? Stocks are selected for The India Letter with a two pronged approach. First we look out for high growth stocks that filter well through fundamental metrics like debt to equity, long term margins and return ratios. Then we meet the managements of the short listed companies to understand the moat that the business enjoys, the kind of growth rate that is sustainable and the driving forces of the entity's long term growth. If the management's vision and long term plan seem to be having the tailwind of one of the key economic Megatrends that we have identified, we select the company. I want to know more about The India Letter? How should I proceed? You can write to us with all your queries and we will be delighted to assist you. Alternatively, you can call us on +91-22-61434055 between 10 am to 6 pm from Monday to Saturday.